Now available in trade paperback, the first installment of the Charlie Parker series by internationally bestselling author John Connolly.Haunted by the unsolved slayings of his wife and daughter, former New York City detective Charlie Parker is a man consumed by guilt, regret, and the desire for revenge. When his search for a missing woman leads him to the killer who destroyed his family, Parker knows payback time has come at last. Aided by a beautiful young psychologist and two career criminals, Parker soon becomes the bait in a trap set in the balmy bayous of Louisiana to catch a murderer unlike any other—a monster who believes himself to be an artist and uses the human body as his canvas. Driven by his visions of the dead and the voice of an old Creole psychic, Parker must seek—and win—a final brutal confrontation with the serial killer known as the Traveling Man. 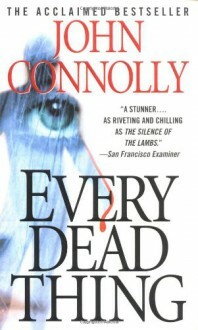 Every Dead Thing is a richly textured, intricately plotted novel that probes the mind of a tormented man whose buried instincts—for love, survival, and even killing—awaken as he confronts a monster beyond imagining and relentlessly pursues justice for the murder of his family.